Please make sure you are ordering what you need. If you have questions please email or call, we will do our best to answer your questions before you spend your hard-earned money. There is no refunds or exchanges on parts that have shipped, period. The only time an exchange will be considered, is if we ship the wrong item. If your order arrives damaged, we will assist in filing for a shipping damage claim, and get you a replacement as soon as possible. If we do not have stock of an item ordered, or we are unable to get it from our vendors in a timely manner, we will offer you a refund, give you an account credit, offer you a used/refurbished part or backorder the part at your request. Please keep in mind that scooter parts change from time to time, and may require a little modifying to fit the original application. Example given; an electrical part may be the same part as it was 2 years ago but the connector may be different or wire is shorter. Keep your old part in case you have to use a piece of it to make the new part work. Any modifications you make to any part are done at your own risk, and Absolutely Scooters & Supply, their agents or employees assumes no liability for damage or injuries sustained from such modifications. Body panels are not generally stocked, with the exception of common panels and panels from new bikes that we have parted out. If you order a body panel please expect additional shipping time. These may ship direct from the manufacturer to you, if that option is available to us. Colors on body panels may or may not match the color of your scooter. There is nothing we can do about this, if you want to make sure that they match the other panels on your bike, you will either have to blend the paint or order a complete set of body panels, or at least the ones adjacent to the damaged one you need. Even though the panels we sell may fit several different brands of scooters, the ones you will be getting from us, will be from Tank-Sports, and may have their name/model printed on them. These decals style and positioning can change several times within a model year. These decals usually are clear coated over, so removing them is not always an option, be prepared to live with whatever decals are on them. On occasion, we may part out a vehicle that was purchased for that purpose, was still around at the models year end or arrived with shipping damage. 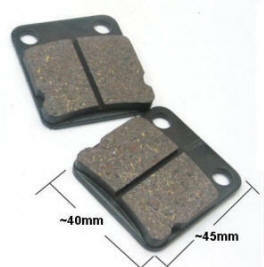 When we sell these parts, they may have a mark on them from fasteners that hold them to the vehicle. Rest assured, these parts are unused and are from a new scooter. Used parts are liquidated through eBay and are not sold on this website. However, we may offer you a used part if the one you ordered is out of stock and not readily available to us. If you choose local pickup, please call or email to make sure your order is ready to be picked up. We operate out of 3 warehouses in the Elgin area, and not all parts are stocked at the dealership. We will do our best to make sure the parts are at the dealership when you are coming to pick them up. If you select local pickup by mistake and intend to have it shipped, you will be billed separately for shipping and order will not ship until shipping invoice is paid. If you notice you did this after you placed the order you can call or email and we can arange to take shipping payment separately. Free Shipping(when offered) is not available on body parts, heavy parts & bulky items, please do not select it if you have these items in your order. If an error has incurred in shipping calculations or you have selected free shipping for inappropriate items, you may be billed for shipping charges and order will not ship until paid. We ship to PayPal confirmed addresses only. Please make sure that your address is correct with PayPal. If you have moved recently, please double check, nobody likes the charges or the delay that accompanies double shipping. We reserve the right to ship with a different method than you select in checkout, if we consider it an upgrade from what you have selected. UPS does not pick up from us on Saturdays. If you place an order after 2:00 PM Central time on Friday or Saturday and choose a UPS shipping method, it is very likely that your order will not ship until the following Tuesday unless we ship it USPS on Saturday. This will be left to the discretion of the shipping manager to get you your order the fastest. Generally speaking All sales are final, we are not Walmart. Please make sure you are ordering what you need. We will exchange if we ship you the wrong item. (Not the item ordered). At no time will we ever refund shipping costs. Furthermore, if an item is returned and it is deemed necessary to refund your money for the item and it was a free shipping promotion item, our actual shipping expenses will be deducted. Shipping damage claims will be filed with the shipping company, and we will work diligently with you to get your product fixed or replaced. For online payments, we accept Visa, Mastercard, Discover, or PayPal only. You may pay with American Express or eCheck through PayPal without having a Paypal account. We ship worldwide and recommend using PayPal for international shipments, it will be processed 2-3 days quicker. We do not ship until clear payment has been made and international shipments may be held for up to 5 business days for fraud prevention. E-check through Payal, or direct deposit to Paypal from your bank account may take up to 4 business days to clear (Credit Card is Instant). Orders will not ship until payment has cleared. Absolutely Scooters & Supply, their shareholders, vendors, employees or agents assumes no liability for any damages or injuries to any person or property (real or otherwise), that take place after sale of any of Absolutely Scooter & Supplys products. Scooters can be dangerous when not used safely, so please, use caution when operating any scooter products. A refused shipment will result in %20 restocking fee plus deduction of actual shipping costs. A returned shipment without prior agreement reached will not be refunded. If you have any questions about anything, please ask before purchasing a product. This will help us have a trouble free transaction.